SASCO provides a wide range of degaussers.What is degaussing you ask? Degaussing is the process of reducing or eliminating an unwanted data stored on tape and disk media such as computer and laptop hard drives, diskettes, reels, cassettes and cartridge tapes. 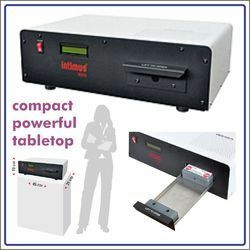 When exposed to the powerful magnetic field of a degausser, the magnetic data on a tape or hard disk is or erased. 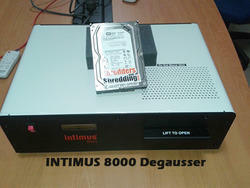 Degaussing is the guaranteed form of hard drive erasure, as such; it serves as the standard method of data destruction. 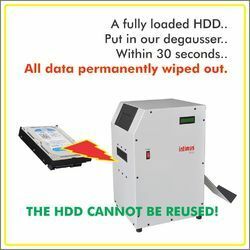 Using the right degausser will guarantee that your information is no longer retrievable.These right degaussers can be provided to you by us.Contact us if you have hard disks and other equipments which need to degaussed. You will get a degausser machine from us that will be the best in quality and very affordable too! Guaranteed , call now for more details. The ASM120 is very user-friendly, just place the media into the drawer and after approximately 30 seconds the tape or HDD is wiped of data. Specially profiled holders make it easy to move. The ASM120 is innovative and easy to use. Equipped with an LCD display that indicates the number of media erased in one session and a total number erased by the device. 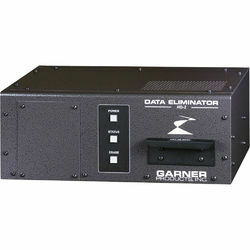 ASM120 degausser is equipped with software that stores historical data like: date, number of eliminated data, number of cycles, and estimation of generated impulse. If you need any help or advice in choosing the right degausser please do not hesitate to contact us. 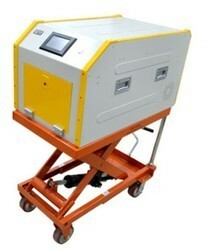 Portable degausser with a trolley that can be taken anywhere in the office complex. 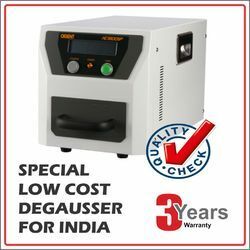 The powerful Hard drive degausser is good for non stop use and for exceptional performance for many years, comes with a comprehensive warranty package and full after sales service support. Available in three sizes - small , medium and large. You can chosse machine according to your use and budget. Call now for more details and prices. 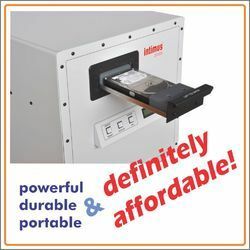 The Garner HD-2 Hard Drive & Tape Degaussererases hard drives (laptop, desktop, and network up to 1" high), and high coercivity tape media, including all formats of LTO (1,2,3,4), SuperDLT I & II, DLT, AIT, 8mm and more, all without any adapters. With a continuous duty rating (no cooling necessary), quiet operation, and a 60-second cycle time, the HD-2 can fit right on a desktop. The HD-2 is exceptionally user-friendly. Simply place your media into the drawer on the right side of the HD-2, and push the "Erase" button. Within 60 seconds your media is erased; open the drawer, and remove your erased media. The HD-2 has been independently tested, and certified to meet both ANSI, and CE standards. Built-in safeguards check the stored power before each erase cycle ensuring complete erasure every time. Audible tones, and lighted push buttons report the status of the HD-2 to the operator. The HD-2 produces an erasing field many times stronger than the erasing fields produced by the read/write heads in hard drives, and tape drives. 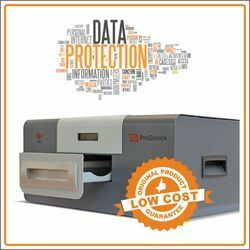 The field strength, along with the encompassing magnetic field ensure the data is no longer recoverable by computer or laboratory attacks. Since the HD-2 does not rely on software, the HD-2 will also completely and permanently erase failed and damaged hard drives regardless of the operating system or interface. The HD-2 will assist you in meeting compliance standards for government mandates requiring complete elimination of sensitive information stored on magnetic media prior to re-use or disposal. When degaussing, the storage media are flooded with a very strong magnetic field that far exceeds their own magnetic force, the coercivity of the hard disk. The short and strong pulse erases the data on the hard disk irrevocably. Degaussing is characterized above all by the simple operation and minimal space requirements, which also allows for its use in an office environment. We are an Indian reputed manufacturing company. We manufacture all types of shredders. We also provide degausser machine with an effective price. We provide best degausser machine for your use at the affordable price. For more details connect with our experts. Degaussing is the process of totally erasing data by reducing or eliminating an unwanted information stored on tape and disk media. A degaussing machine changes the magnetic area, where the data is stored, of magnetic data storage devices. When the degausser is applied to magnetic domains the information is scrambled into random patterns, making the data stored in the magnetic domain unreadable. 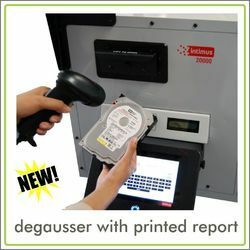 The correct use of a the appropriate degausser will ensure that information is no longer retrievable. Call us for more information about degaussing and degaussing machines.